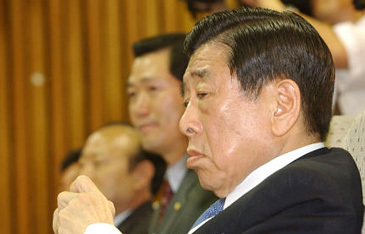 Jailed IOC vice president Kim Un-yong resigned May 20, 2005 from the Olympic body, rather than face an expulsion vote. Kim Un Yong of South Korea, facing expulsion from the International Olympic Committee after being jailed on bribery and embezzlement charges, has resigned, the committee said May 20, 2005. Mr. Kim, 74, told the committee of his decision in a letter received today, bringing the expulsion process to an end, the organization announced. One of the most powerful figures in the Olympics movement and the highest-ranking member of the committee forced to quit, Mr. Kim was suspended as vice president of the I.O.C. in January 2004. He also stepped down last year as a member of the South Korean National Assembly, admitting that at times he had been careless and that "I did things wrong." Mr. Kim is serving a two-year prison term. The I.O.C. 's ethics commission, saying that Mr. Kim had "seriously tarnished the reputation of the Olympics movement," called for his permanent ouster in February. That recommendation was later backed by the Olympic committee's executive board. Mr. Kim's fellow I.O.C. members were due to vote on the recommendation at a meeting in Singapore in July. A Bulgarian member of the committee, Ivan Slavkov, faces expulsion at the meeting. Mr. Kim was convicted of embezzling from the World Tae Kwon Do Federation, the World Tae Kwon Do Headquarters and other sports organizations that he controlled. He was also found guilty of embezzling $676,000 from money donated by the Samsung Electronics Company of South Korea. Mr. Kim denied the charges, calling them politically motivated. But his appeal against the sentence, which also included a $760,800 fine, was rejected by the South Korean Supreme Court in January. Today's action was not his first brush with the Olympics establishment. In 1999 he received a "most serious" warning after an inquiry into the cash, scholarships and other inducements offered to Olympic committee members by bidders for the 2002 Winter Games in Salt Lake City. Ten members of the committee were expelled or forced to resign because of the bribery scandal.